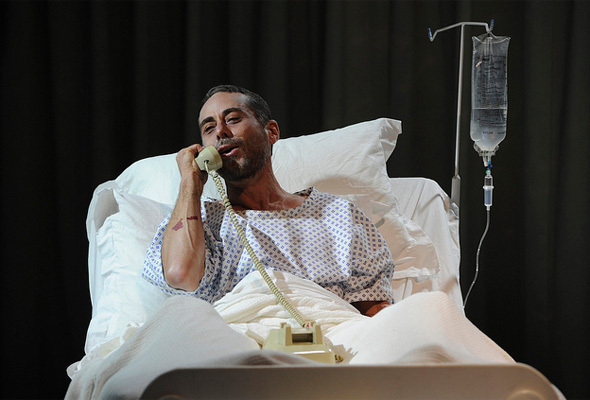 Marcus Graham’s electrifying portrayal of Roy Cohn in the 2013 Belvoir production. Synopsis: (as before) Three threads of American living gradually interweave in the cold new era of Reagan and in the face of the catastrophic AIDS crisis. Louis is confronted with his own cowardice as he abandons his lover Prior to struggle with his diagnosis of AIDS alone. Mormon couple Harper and Joe struggle with the constraints of their religion as sexuality and addiction collide. Roy Cohn, a New York arch-conservative lawyer responsible for the death of Ethel Rosenberg, refuses to submit to the label entailed by his deteriorating health. What moved me: perhaps what is most moving about this work is that it has such a thick weave – there is so much going on in every moment – that its indictment of American Individualism coming at the cost of universal healthcare becomes just a single, ironcast, thread amongst many. BELIZE: Well I hate America, Louis. I hate this country. It’s just big ideas, and stories, and people dying, and people like you. The white cracker who wrote the national anthem knew what he was doing. He set the word “free” to a note so high nobody could reach it. That was deliberate. Nothing on earth sounds less like freedom to me.